If your registration includes a non-member spouse or guest, they'll need to pay an additional $10 when they board the bus. (Unfortunately, the website didn't allow us to charge this when you registered). Online Payment Required to complete registration. Hop aboard our private motorcoach for a full-day excursion to the Huntington Botanical Gardens. 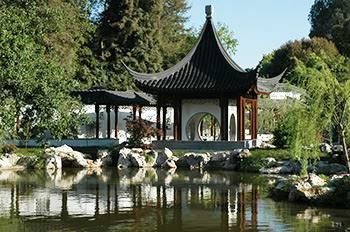 We'll start with private small group docent-led tours of the Chinese Garden, among the largest Chinese-style gardens outside China. Designed to promote the rich traditions of Chinese culture, the garden is truly a cross-cultural effort. Architects and artisans from China worked alongside California builders and gardeners. As a result, the Garden of Flowing Fragrance combines the botanical with the artistic and scholarly. Lunch is on your own at either the Cafe or the legendary Rose Garden Tea Room. Afterwards you have the afternoon to explore the rest of the Huntington Botanical Gardens or Museums on your own, including the new California Garden (shown at top). We'll head back to San Diego in late afternoon, arriving early evening.Transportation: Private motorcoach with small bathroom. Roundtrip from Old Town San Diego Transit Center or I-5/La Costa Ave. Park and Ride. Tour Details: Arrive/start private group tour of Chinese Garden 10 AM, end by noon. 8 persons per docent. Balance of day until 3:30 PM at leisure to tour other gardens and museums on your own. Water: 1 bottle of water per person will be available each way on the bus. Select Old Town or La Costa pickup location when registering. $25 cancellation fee up to March 15; after then no refund, but you can find a substitute to take your place. Full refund if trip cancelled due to inadequate signups. Tour operates rain or shine!